Ten dreadful days. That’s how long Tahlequah, the female orca also known as J-35, has been carrying her dead calf in mourning through the Pacific Northwest’s Salish Sea. 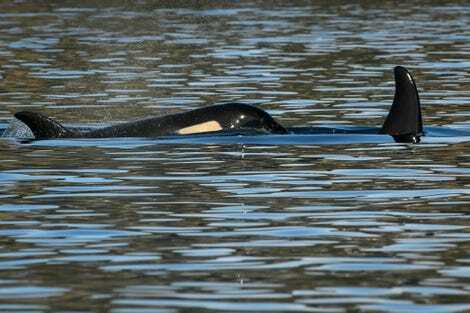 The female baby orca lived a mere half hour after being born July 24. Its body has begun to decompose, but that hasn’t kept the mother from holding onto the calf. Once she does release it, researchers want to conduct an autopsy and find out what exactly killed it. The thing is, they already think they know. Salmon – or a lack thereof – is the likely culprit. And climate change is making the situation worse, experts told Gizmodo. Whereas other orcas will prey on smaller marine mammals like seals, the group that hangs out in the inland waters of Washington state and British Columbia, known as the Southern Resident killer whales, eat only salmon. And not just any ol’ salmon: Chinook salmon, to be exact. Unfortunately, many populations of these giant salmon are endangered or threatened, a reality which is having disastrous ripple effects on this whale population. A June survey revealed the Southern Resident killer whale population is down to just 75. No calves have been born since 2015. And in the eight years before then, 69 percent of the 35 individual pregnancies failed, according to Samuel Wasser, the director for the University of Washington’s Center for Conservation Biology who’s studied these animals. The death of J-35’s calf is just one example of how the population is struggling. There’s also J-50, a 4-year-old female orca, who is malnourished, abnormally small, and at risk of dying. The National Oceanic and Atmospheric Administration is now planning an intervention to save it. The agency is worried J-35 will be next to go if she keeps up her mourning ritual much longer. The Southern Resident killer whales can’t afford another loss. Healthier orca pods up north sit in the range of 300. That’s where Wesser would like to see the population at the very least. He’s examined what’s pushing this population to the brink, and a study he and others published in PLOS ONE last year concluded nutritional stress is to blame. The whales need more food. They also need quieter and less toxic environments. That’s why some environmentalists are opposing Canada’s Trans Mountain Expansion Project. They worry that the shipping of that pipeline’s oil could spell disaster if there’s a spill or even just in the increase in noise from vessels. With climate change warming the waters the Chinook swim in, their survival becomes more and more difficult, said Misty MacDuffee, the wild salmon program director at environmental organisation Raincoast Conservation Foundation. J-35’s heartbreaking display might have drawn attention to these issues, but the whales and the salmon they depend on have been in decline for years. And the Suquamish Tribe off the coast of Washington state has spent decades calling for better protections of their ancestral waters, both for their sake and that of their orca neighbours, said Chairman Leonard Forsman. These animals hold cultural and spiritual significance to many of the Salish Sea Tribes and appear in Suquamish creation stories. “We’ve been standing up for [Puget] Sound for a long time, so for us, this is a symptom of what we’ve been fighting for decades and continue to battle now,” Forsman told Gizmodo. He and his people are heartbroken at the Southern Residents’ plight. And they’ve taken action. Last year, they sued the U.S. Coast Guard over the impacts of shipping traffic on the whales. They also helped kick off the Southern Resident Killer Whale Task Force Washington Governor Jay Inslee announced in March. Forsman hopes the creatures can get the food they so urgently need – soon. But he knows it’ll take more than that to save them in the long term. “Their predicament is a reflection of our choices,” MacDuffee said.